You can read on fellow Catalan KDE translator blog that his son got an English learning CD that states to be compatible with two of the spanish regional goverment distributions, interesting to see that on an "Oxford University Press" material. It does not state "GNU/Linux" compatibility, but it seems a sign that we are getting there. WARNING: This is a unstable release, it is actually 0.10 Beta 2 release, it should work like any release from the 0.8 branch, but do not blame us if it makes your chair break. WARNING: This is a unstable release, it is actually 0.10 Beta 1 release, it should work like any release from the 0.8 branch, but do not blame us if it makes LHC destroy the world. Somehow i managed to forget to announce here we are looking for organizers for this year KDE Spain users and developers meeting. 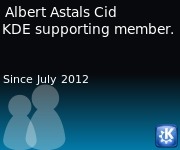 If you are interested have a look at http://www.kde-espana.es/akademy-es2008/ubicacion.php. We are accepting proposals up to september 15th. Just two fixes, but you really want it as fixes a regression in Form handling introduced in Poppler 0.8.6. At the poppler project we are trying to relicense all our patches as GPLv2 or later so that in case that xpdf is ever relicensed to something newer than gpl2 only we are not stuck because of patches. The problem is that we have problems getting answers from everyone, so i'm posting this so that in case you know some of the missing people in person or have IM adreses of them, you can bug them for me.